Hearthstone cards have varying degrees of rarity, legendary being the most exotic. My favourite legendary is Ragnaros, although I'm smitten with Ysera at the moment. One day I hope to be able to call upon Jaraxxus. 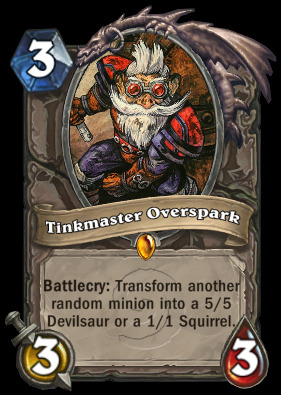 Nat Pagle and Tinkmaster Overspark have both had their values tweaked. Pagle still has a 50% chance of drawing an extra card, but it now happens at the start of your next turn rather than the end of this one. Tink's battlecry effect is now random, rather than directed, and his health and attack has each risen slightly. You can no longer activate your own secrets. Wait, you could activate your own secrets?! If you win 500 games with a particular hero, you now unlock a golden hero. You can track your progress on the deck selection screen, where you will notice that it doesn't take into account any games you've won prior to this patch. Doh. New card backs have been added. "Collect these by doing awesome things such as participating in each ranked season." Deal! There's a lot more, though, so if you haven't already, check out the patch notes. They're the details you fall asleep remembering (or hearing - damn the music), but the game that lurks beneath them won't be far from your mind when you're lying awake either. Like Magic the Gathering (although you don't have to like Magic the Gathering), Hearthstone is built around the concept of killing the other guy's hero by playing cards that represent minions, spells and direct attacks. A pool of mana crystals that starts off small and automatically grows throughout each one-on-one match dictates how many cards you can play per turn, and this forced march towards crescendo gives the game its zip and verve, while also ensuring that even the longest match fits into a lunch break. There's more to it than that, of course, and while the rules aren't new to card games, they have been fine-tuned to perfection - so much so that you spend a lot of your first few hours simply enjoying their elegance. Taunt, for example. Minions with taunt have to be attacked before anything else, disrupting your opponent's play, but there are ways to get around this. Cards with the silence ability can remove taunt status, reducing taunt cards in stature, while spells with no attack restrictions can ignore them and, in Hearthstone parlance, go to the face of the opposing hero. Naturally there's a cosmetic flourish to taunt cards as well - as they drop to the board, a metal shield springs up around them and a little dance of light plays out along the edge of it as they settle into place. The fun of observing and employing these intricacies (and many others) is a constant companion whether you're a new player or a hardened veteran with dozens of hours under your belt, and the cards that Blizzard has put together using these building blocks are wonderful too. Nearly a year of testing has created a reliable balance between them, meaning that decks built around particular strengths and combo ideas cycle in and out of popular usage as people come up with new strategies and counter-strategies. Card values evolved a lot during the closed phase of the Hearthstone beta (Pyroblast OP LOL), but Blizzard has said it hopes to avoid changes now we're live. Nailing your own variations is particularly rewarding. I'm very happy with my Druid control deck at the moment, for example - it's good at clearing the board early on, disruptive in the middle of a match and super-powerful the longer things last. It's a brutish deck, though, and I'm starting to feel exposed against wily Priests if I waste a few strong spells and debuffs too early, leaving them too many tools to disrupt my play later on. Maybe it's time for a tweak. Learning to plan ahead and solve those puzzles is part of the fun, of course, as is getting a grip on each of the nine classes. Each has its own hero power - an attack that can be used once per turn - and specific cards, too, and discovering how to make the most of these is very rewarding. The game starts with a single-player campaign playing as the Mage against AI opponents, so here's a good Mage tip: if you ever find yourself with a Mana Wyrm, The Coin and Mirror Image in your hand on turn one, play them in that order. Enjoy. There are potentially millions of little and large combinations to figure out as you get into the game and gain a better understanding of the interplay between all the different cards and their effects, which gives Hearthstone tremendous depth and variety. But while this is the same Blizzard that made StarCraft 2, a game you can play for dozens of hours without ever becoming remotely good at it, Hearthstone is also a surprisingly easy game to figure out and enjoy. The tutorial stuff helps, but the matchmaking against human opponents is so well tuned and there are so many people playing it that you're almost guaranteed a steady incline in difficulty as your understanding improves. It's also weirdly fun to lose at this stage, because it's often down to something you hadn't considered, like that card used with that spell, which immediately sends you off into the deck-building interface to try and replicate it. There are also thousands of deck concepts you can find online, too, and a thriving Twitch streaming community of charismatic players whom it pays to watch and learn from. Hearthstone is a sufficiently slow-paced game that you can always work out what's going on, even though it may be many weeks before you hone your tactical imagination to replicate each feat. Who are my favourite streamers? Well, everyone swears by Trump, and you'll learn so much watching him play a few games, although I'm a bit partial to Moldran too. I mentioned the practice of building decks you discover online - sometimes called 'net-decking' - and it's worth adding that it's a double-edged sword for Hearthstone because it means you run into a lot of copycat decks originally designed by top players. This will probably ease up over time as Blizzard releases expansions that introduce many more cards, simply because the range of possibilities will increase exponentially and therefore so will the variety of deck concepts your opponents wield. But for now it's fairly noticeable if you play a lot online, which is the core of Hearthstone. Along with unranked games (with solid matchmaking), Arena mode and one-on-one games against friends, another core mode in Hearthstone is ranked matches. These have evolved into a season format over the course of the beta - you start off as an Angry Chicken, rank 25, and by earning stars for wins you ascend the ladder until the season ends after four weeks and everyone is reset. There are more nice touches here - you can't lose stars below rank 20, while players who finish a ranked season at a high level won't start the next one on the lowest rung. The latter is another product of beta testing - a change designed to stop you running into a seriously underrated opponent and getting pinched and punched on the 1st of every month. My highest ranking is 12 or 13 (I forget which) using a Druid control deck. You there! Don't hurt yourself as you flop onto the comments to question my skills. Net-decking means there's often a familiar feel to the opposition and some patterns of play, then, but each encounter is still unique and enjoyable. That's because the magic of Hearthstone isn't just in the strength of cards and decks - it's in the ingenuity of the person using them. It's in those moments of realisation - noticing you have just the right cards and board conditions to wipe out an opponent's defence, or restraining yourself one turn and gaining the upper hand a turn later. Perhaps net-decking makes it harder for your own half-finished deck concepts to survive first contact with matchmaking, but losing still means figuring something out and having fun at the same time, and overall it feels like a small price to pay for the enormously enjoyable online community that surrounds the game. I haven't mentioned Hearthstone's business model up to this point, but don't worry, that's a good sign. You may already know that it's a free-to-play game supported by micro-transactions, but you really can play Hearthstone for as long as you like without spending any money. You earn gold for winning matches and completing little achievement-style quests that cycle daily, and gold buys you packs of cards or entry into the Arena mode. If you want to buy more packs, you can throw real money at it, and if you don't have the gold to hand you can pay real money to enter the Arena, but there are no timers to worry about and it isn't especially pay-to-win. OK, if you spend loads of money you will inevitably unlock more of the strongest cards faster than another player, but by the time you care enough about such things you will have spent many hours playing the game, so perhaps paying a bit of money at that point to support the work of the developers makes sense. Besides, strong cards alone do not make a good deck. There is an element of luck at work in Hearthstone, but you can mitigate it so much by good deck design and sensible decisions that it rarely feels like you're dying at the hands of the Random Number God. Arena is a little different - it's a special mode where you build one-off decks out of randomly drafted cards and then face other people doing the same, getting booted out after three defeats and given rewards based on how many games you won. There is a school of thought that it should be self-sustaining - playing it reasonably well should earn enough gold to buy your way back in - but in practice you will need to play the other modes as well to keep topping up your gold. If the thought of that makes you absolutely furious, I think you're overreacting, but there's nothing wrong with your point of view. Have a biscuit. For me, though, the cost of Hearthstone feels wildly insubstantial next to the pleasure and value you get from playing it. I have played around a thousand matches now, spent a bunch of money early on but nothing since, and now have no ongoing costs unless I'm feeling flush, in which case I may consider paying another £1.49 to jump into Arena rather than completing my dailies to pay for it. Dungeon Keeper it ain't. In fact, Hearthstone is unlike a lot of games. It's a card strategy game that is bright and accessible. It's a free-to-play game with generosity of spirit. Heck, it may not have all the features its fans are demanding just yet, but it's even a Blizzard game where "coming soon" actually means coming soon. It's overflowing with character and imagination, feeds off and fuels a vibrant community of players and performers, and it only stands to improve as Blizzard introduces new features, an iPad version and expansions. And now it's finally finished! I can't wait to see where it goes next. Job's done. Don't forget to check out our Naxxramas guide if you're struggling with any of the new encounters.